The mid-point of A Series of Unfortunate Events has felt a little wobbly for me. The efforts to change the usual paradigm by removing the whole guardian dynamic was interesting but we haven't seen all that much accomplished by the Baudelaires. And as true as it is that the book has tragedy and woe woven into the very nature of things but you still want to feel like there's hope and reason to move forward. The Slippery Slope is perhaps that critical turning point and a reminder of how far the Baudelaires have come since they first learned the news of their parents' death so many books ago. They're still mostly on their own but they have more hope than before and a reason to keep fighting. Things only accelerate from this point and the series really starts getting serious about resolving things, more or less. You can really feel that shift starting in this book because the gloves are off and both sides - and yes there are sides - enter end game. 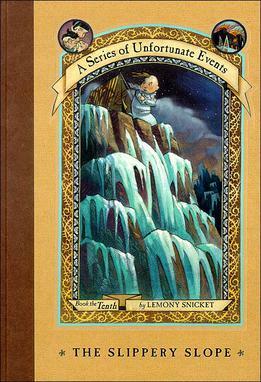 Synopsis: The Slippery Slope is the 10th book in Lemony Snicket's A Series of Unfortunate Events books. This book will be included in the third season of the Netflix television series. The book begins immediately after the end of The Carnivorous Carnival with Violet and Klaus in a runaway caravan barreling down the steep mountainside with Sunny a prisoner of Count Olaf and his cohorts. And while it is narratively certain that the two siblings will escape their perilous fate (or there wouldn't be much of a book), I'll leave the details for you to discover once you read the book. It's totally worth it, believe me. The rest of the book has the Baudelaires separate as Violet and Klaus try to make their way to Count Olaf and thus to Sunny. The two encounter a group of Snow Scouts that happens to include the rather obnoxious Carmelita Spats that we had last encountered in The Austere Academy. They're not the sort of help you'd expect to find but it turns out one of the scouts is more than he seems. Meanwhile Count Olaf is already at the peak of Mount Fraught preparing for a plan of his own with poor Sunny being forced to prepare meals for them despite her age. What I Liked: This book finally begins to answer some of the V.F.D. questions that I've had for quite some time now and we get a better look at things at to some degree a limited understanding of what those letters really mean. Brilliantly (and infuriatingly) V.F.D. turns out to stand for a great many things and thus perhaps all V.F.D. definitions are somehow relavant to the central mystery of the series. And the book has a larger theme of growing up, something that somewhat began when Klaus remembered it was his birthday during The Vile Village and better realized here. This is brought into focus for Sunny who is left without one of her siblings to help her for the first time in a while and this forces a bit of growing up indeed in order to find a way to keep ahead of Count Olaf. And you really appreciate that well deserved character moment in the context of everything else that had occurred. What Could Have Been Better: I'm not quite sure why Snicket decided to bring back Carmelita Spats here if only because she was successful at being a very annoying character maybe? She was one of the more memorable aspects to The Austere Academy but that didn't mean she was worth the return. But here she is with the scouts and this acts as a setup for other characters coming back in the remaining books of the series. I'm not sure what the point of expanding Count Olaf's troupe with the circus freaks while not really commenting on the members of the troupe that had been left behind in past misadventures. While we don't really get a lot of time with them across the books, there used to be a bit of a consistency with how they were described before things started to change. But hey, this book is all about growing out of the old and adopting the new and things do shift around quite a bit. TL;DR: The Slippery Slope is a great chapter in the larger saga of the Baudelaries and the mystery of V.F.D. But even as the Baudelaires make some headway forward, this does not mean Count Olaf and those forces allied with him are idle and this growing darkness certainly helps shape the larger story. Thus the book gets a great 5 delicious dishes almost miraculously prepared by Sunny out of a possible 5.